UPDATE: Added Fiat Chrysler statement below. In the race to get the average fuel economy of new vehicles to a 54.5 CAFE standard by 2025, the automakers hounds are beating the regulatory rabbit. That was the news today from the Environmental Protection Agency's (EPA), which announced that for the second consecutive model year, national greenhouse gas (GHG) emissions from the automotive industry are better than the regulations call for at this point. The EPA said that overall industry compliance for the 2013 model year was 12 grams per mile – the equivalent of 1.4 miles per gallon – better than the level required by the 2013 standard. The full details can be found in the second annual "Greenhouse Gas Emissions Standards for Light Duty Vehicles: Manufacturer's Performance Report." Speaking on a conference call with reporters, Janet McCabe, the acting assistant administrator of the EPA, said that the program takes the long view. "I think everybody is familiar with the fact that gas prices go up and down over time," she said. "The best way for people to make sure that they're going to be able to weather high gas prices or low is to invest in a fuel efficient vehicle." Another important factor is that the program was set up to be "respectful of the choices that consumers make on the vehicles that they buy, and the important thing to note here is that, whether it's a small car or a larger car, they are all getting cleaner, they are all emitting less greenhouse gases over time and that will continue to go down." Chris Grundler, the EPA's director in the Office of Transportation and Air Quality, said that two-thirds of the overcompliance comes from reduced tailpipe emissions. The remaining third is made up of lower GHG emissions due to improved AC systems and that a small amount (about 14 percent) comes from automakers taking advantage of credits, from building things like flex-fuel vehicles. "In the design of the program, we anticipated automakers taking advantage of these different market mechanisms, so this was always part of our projections," he said. "The fact that the industry is doing substantially better is very good news and tells us that this kind of innovative policy design is indeed production the results that we expected." Don Anair, the research and deputy director of the Clean Vehicles program at the Union of Concerned Scientists, said in a statement that, "On average, vehicles are a full year ahead of where they need to be to keep up with the standards." How this all affects the upcoming mid-term review of the 2025 CAFE standards is not clear, but McCabe hinted that this near-term report is just that, and that the EPA will be looking at the long-term plans and will talk to automakers to determine if any adjustments need to be made to the 54.5 standard. WASHINGTON – For the second consecutive model year, the automotive industry outperformed the national greenhouse gas (GHG) emissions standards by a wide margin. Overall industry compliance in model year 2013 was 12 grams/mile – or 1.4 miles per gallon – better than required by the 2013 standard. These were among the top findings released today in the Environmental Protection Agency's (EPA's) second annual "Greenhouse Gas Emissions Standards for Light Duty Vehicles: Manufacturer's Performance Report." The report presents detailed information about how individual firms are complying with GHG emissions standards for cars and light trucks. "These findings are a terrific early success story for President Obama's historic effort to reduce the pollution that contributes to climate change," said EPA Administrator Gina McCarthy. "Automakers are racing to meet our goals. The American auto industry has never been stronger, we're creating jobs here in the U.S., selling cleaner cars here and overseas, and consumers are really benefiting from the innovations spurred by these standards." Overall industry compliance in model year 2013 was 12 grams/mile better than required by the 2013 standard. This marks the second consecutive model year of industry outperforming the standards by a wide margin. The majority of manufacturers (representing more than 99% of sales) met both the 2012 and 2013 standards. The remaining manufacturers have several more years to come into compliance. Automakers are using the optional flexibilities built into the standards such as improved air conditioning systems and the use of fleet averaging. These flexibilities continue to increase consumer choice, spur technology innovation and decrease compliance costs all while providing manufacturers with options on how and when to make reductions. According to EPA's most recent CO2 Emissions and Fuel Economy Trends Report, model year 2013 vehicles achieved an all-time record average of 24.1 miles per gallon (mpg) – a 0.5 mpg increase over the previous year and an increase of nearly 5 mpg since 2004. Average carbon dioxide emissions from cars and light trucks are also at a record low. Fuel economy has increased in eight of the last nine years. There are more than three times as many 30 mpg vehicles than just five years ago, and fuel economy of SUVs has been increasing faster than for any other vehicle type. EPA's GHG emissions standards cover light-duty vehicles from model year 2012 to 2025. The standards are projected to save 12 billion barrels of oil, and cut 6 billion metric tons of greenhouse gases over the lifetimes of vehicles sold in these years. The standards are also projected to save consumers who purchase a new MY 2025 vehicle more than $8,000 in fuel costs over that vehicle's lifetime. Car fuel efficiency and global warming pollution standards are working, a new Environmental Protection Agency (EPA) report shows. 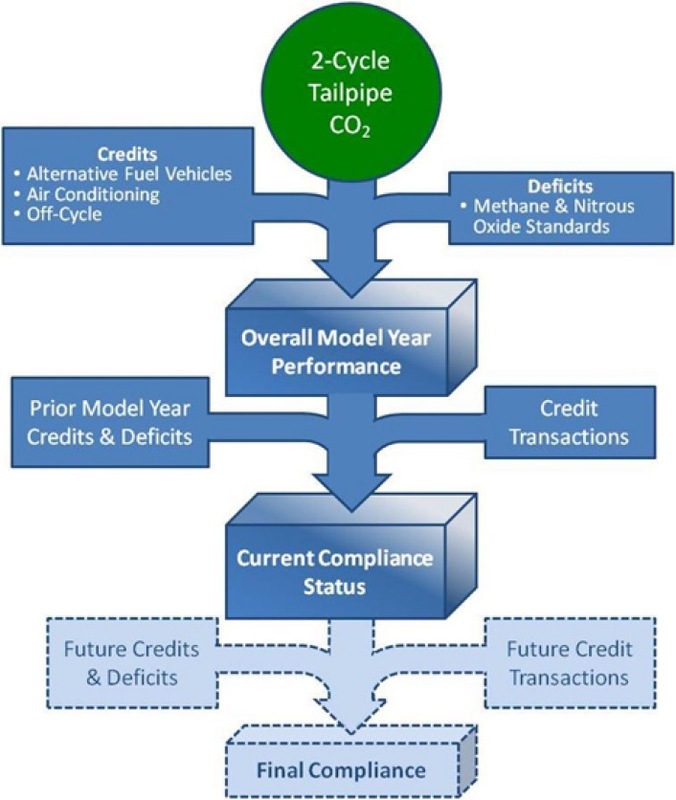 The report, which documents the emissions and fuel consumption of vehicles sold in model year 2013 as well as the credits earned towards compliance with the rules, shows auto manufacturers are exceeding the standards set in 2010, leading to savings for consumers. Below is a statement by Don Anair, research and deputy director of the Clean Vehicles program at UCS. "Car fuel economy and emissions standards were a major achievement and this new EPA report shows just how well they're working. The cars that came out in 2013 are emitting 9 percent less carbon pollution than in 2010. Most automakers are not just meeting, but exceeding, the standards. Their investments in new technologies are paying off, and drivers are benefiting. "The EPA report shows that tailpipe emissions are falling, improvements in air-conditioning technology are happening even faster than expected, and on average, vehicles are a full year ahead of where they need to be to keep up with the standards. "Compared to 2010 vehicles, 2013 vehicles will save drivers over $100 a year at today's gas prices, or a total of nearly $17 billion over the lifetime of these vehicles. Today's cars offer more efficiency even as they're adding new features and safety technology. "If we're going to cut America's oil use in half over the next 20 years, we need to build on the impressive progress we've made. This report serves as a strong indication that manufacturers are well positioned to further reduce emissions and fuel consumption from new vehicles in the years ahead. "The standards are doing what they're supposed to do-spurring innovation, saving drivers money on fuel costs and reducing the emissions that cause climate change. As this report shows, we're heading in the right direction." March 26, 2015 , Auburn Hills, Mich. - Internal-combustion engines continue to dominate the marketplace. FCA US LLC leads the industry in the proliferation of affordable technologies that improve the efficiency of vehicles equipped with these engines. We will remain on this path, introducing new technologies that contribute to continued regulatory compliance, while responding to customer preferences.